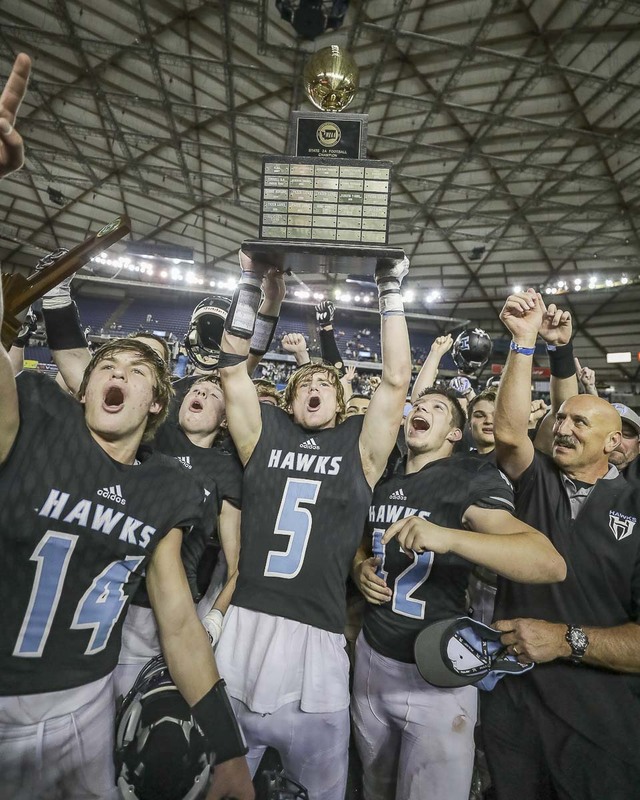 TACOMA — Known for throwing touchdown pass after touchdown pass, the Hockinson Hawks went old school on Saturday to win the Class 2A state football championship. The Hawks went into a Wildcat formation. The Hawks looked at their opponents. They pretty much told them exactly what they were going to do play after play. And the Lynden Lions had no answer. The Hawks decided to challenge their offensive linemen to move the Lions, to make way for the ground game. In addition to Oldham, the offensive line group includes Nathan Balderas, Ki Haden, Takumi Veley, Garrett Kondel and Spencer Lindberg. The team with more than 50 touchdown passes in the first 12 games, ended up with just one in the championship game … and five rushing touchdowns. “Just being able to block for Sawyer is a privilege. You’re never going to meet another kid like him,” Oldham said. 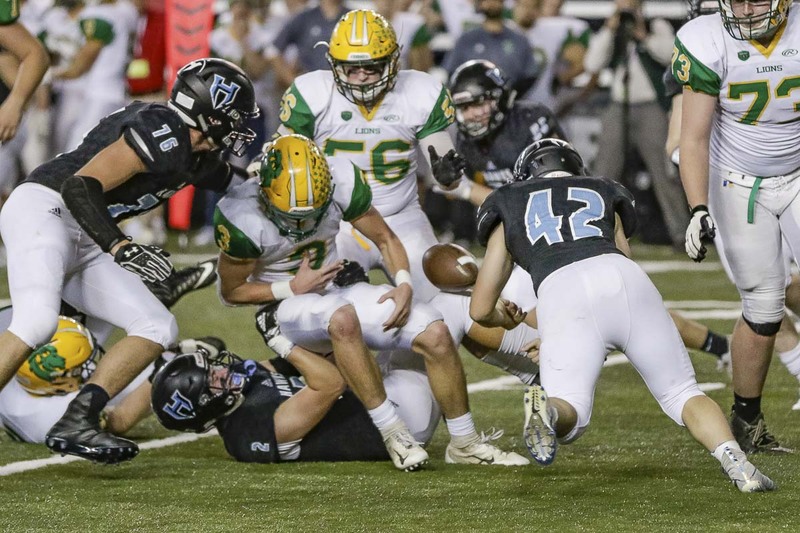 Sawyer Racanelli rushed for a championship-game record five touchdowns, all in the second half, all after Hockinson trailed by 17 points. Yes, the pass-happy Hawks rallied from 17 down — with a dominating performance by the offensive line and the run game. “Our big guys stepped it up, gave 155 percent, and we absolutely dominated,” Oldham said. Racanelli finished with 85 yards on 15 carries. All of those carries came in the second half, too. “Our offensive line did unbelievable,” Racanelli said. 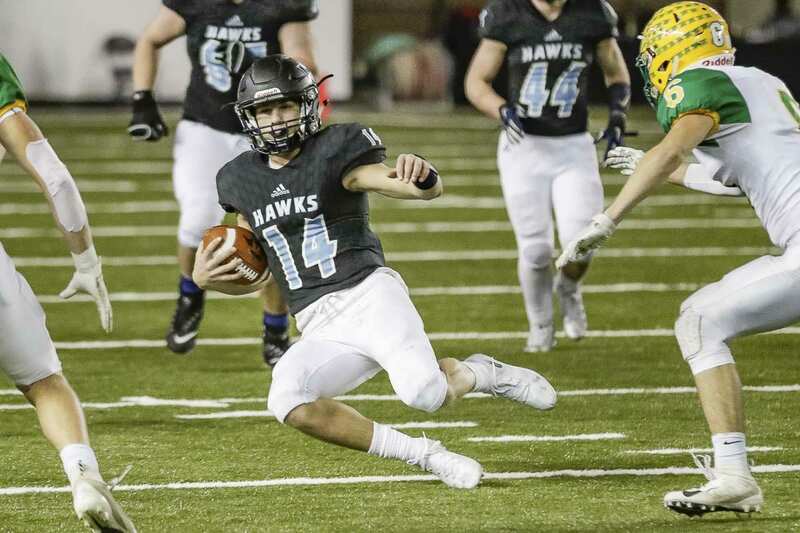 Hockinson quarterback Levi Crum added 70 yards on the ground. He watched the final drives, loving his view as Racanelli set up in the Wildcat. 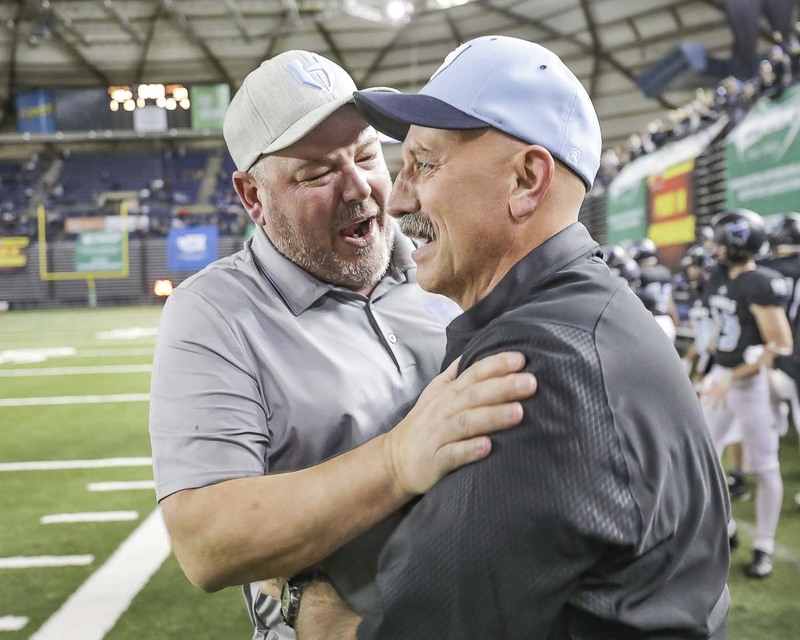 A Hockinson coach told the media before the game that Racanelli had changed jerseys for the championship game to honor a teammate. Racanelli, normally No. 11, wore Peyton Brammer’s No. 9 in the finals. Brammer broke his foot in the quarterfinals and missed the last two games. 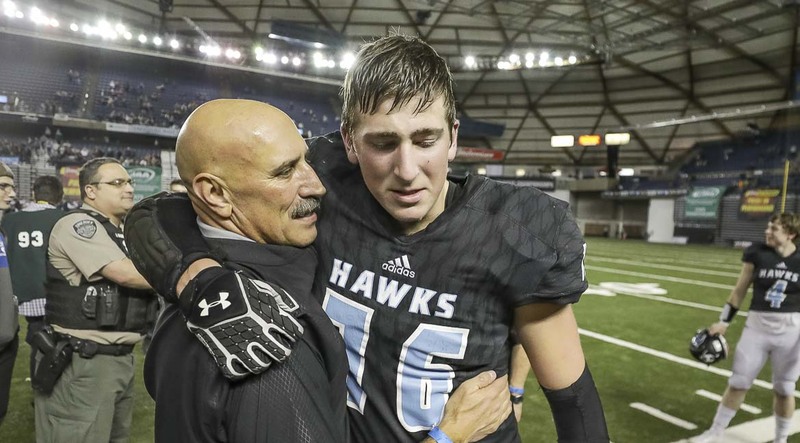 Now that Hockinson has won, and now that Racanelli set a record for most rushing touchdowns in a 2A title game, the full truth can be revealed. Coach Rick Steele confirmed that Racanelli forgot his jersey. After scoring five touchdowns while wearing No. 9, maybe Racanelli and Brammer should trade jerseys for all of next season. Levi Crum went undefeated in his first season as the team’s starting quarterback. He also threw for 51 touchdown passes. And in the championship game, he caught a touchdown pass. Yes, that is a successful campaign. 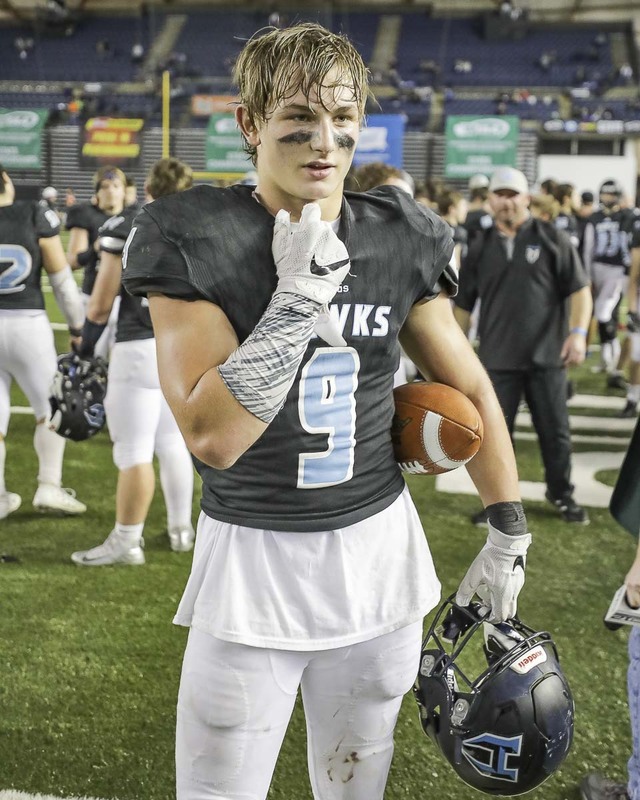 Crum caught a touchdown pass on a trick play from Racanelli, who was playing receiver, for Hockinson’s first touchdown of the championship game. “A little different stat line,” Crum said with a smile. “The quarterback’s got hands. Not just a throwing arm,” lineman Nathan Balderas said. The Hawks were down 10 at halftime. They were down 10 at halftime last week, too. 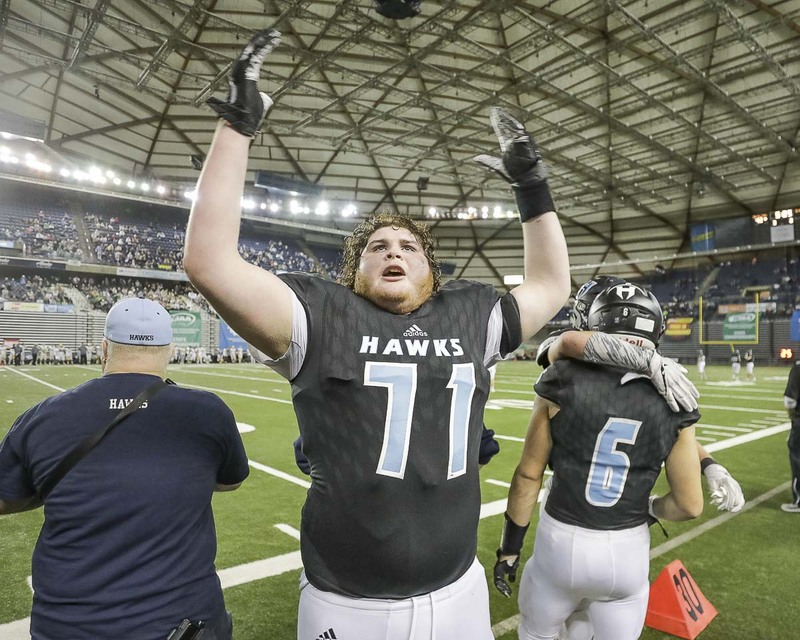 With the comeback completed, with the second consecutive state title secured, with 27 consecutive wins … Steele was just a bit overwhelmed.